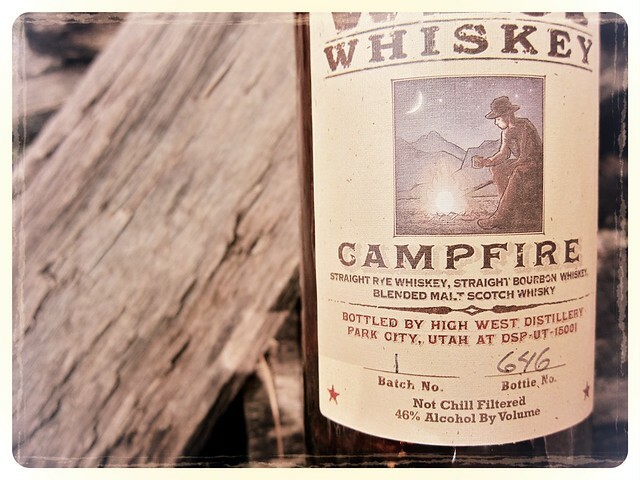 Every other ghatblammed whiskey writer seems to have waxed poetically on the jackelope-like qualities of High West Distillery’s new Campfire whiskey – a blend of straight rye, straight bourbon and blended malt Scotch that ends up anything but straight. Its like a crooked trail through the dry, magnificent deserts of Utah that ends up in the rain-drenched peat bogs of Scotland, via the rye and corn fields of the great American plains. Actually, that’s exactly what it is. It all started with a sip. Not just any sip, mind you. Perk had spent the day chopping up the big oak tree that came down in the lightning storm the week before. You know, that oak tree that used to stand sentinel over his rows of corn down on Lawrenceburg Road. The tree was old but sturdy, not the kind to be felled easily, but lightning has a way of turning tree to toast. The smell after the storm lingered for days all around, and Perk’s work on the wood just brought it out even stronger: the buzzsaw scent of fresh-cut oak combined with the charred remains of singed bark, a bit of tree sap burnt like sugar in a skillet sticking it all together. Perk liked the chopping, if only for the memories racing through his mind as he axed his way through the downed tree. It was the scent more than the act itself that triggered those memories of a simpler time. A simpler time that was anything but simple. As he took his first sip of rye that same night, the spice and bite were like a kick in the dusty pants, and those same memories that the oak brought out earlier in the day began to crystallize into something entirely different in his mind. Memories merged with dreams and came out, somehow, as an ambitious but highly suspect plan. A plan that would take him far away from Lawrenceburg Road. When Perk woke up, his head seemed to drag a few feet behind his body. Those sips of rye had accumulated to something more like a deluge. But through the deluge, the plan he had hatched managed to hold its form. It took a few coffees, amped up on that hazelnut vanilla crap he had grown accustomed to thanks to his last girlfriend, for all the details to come into focus. But that very same morning, memories and plans and dreams actually turned into actions. He picked up the old circular dial phone, the one his dad once used, and called up the airline for a one way flight to Edinburgh. He would take the train out to Aberdeen, and from there… well, his plans hadn’t gotten that far. But he knew, despite the distance, he would find a home where the spray of the sea mingles with the deep funk of burning peat. Perk wasn’t wishing to wash away the past. On the contrary, he hoped, he knew, that the scents he could only seek in Scotland would stir up memories that even the oak and the lightning couldn’t. He knew there was a key, hidden in the Scots mist, to unlock the same mystery that his father before him couldn’t solve. He knew he had to go. Verdict? Excellent. Inspiring and unique stuff, enough so to inspire fan fiction. You’ll find here an intriguing story of bourbon sweetness, rye spice, and Scotch smoke happily playing tug of war. 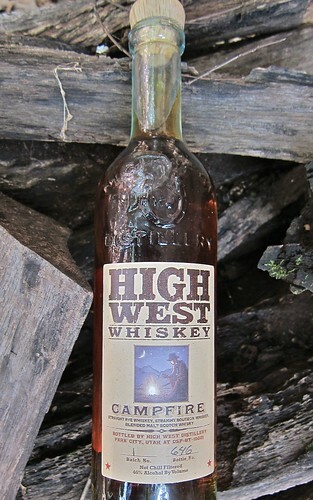 Full Disclosure: Bottle received as a tasting sample from High West. definitely very innovative whiskies they’re doing over there in Utah. Love the sake-like qualities of the Silver Oat, and I must say that this one sounds deviously good. Brad – great stuff. This is hilarious. Perkins needs to see this for sure. I’m betting he’ll get a kick out of it! I am tired of the whiskey review formula – a stream of poetic-ish “notes” arranged like magnet poetry (clove, spice, vanilla). A limited vocabulary does does little justice to so many different whiskies! Some (Jason Pyle/SMM) do an outstanding job, but most do not inspire me to try a pour (or bottle). Jason does. I read this post following a pour of Campfire and found it to be fresh, unexpected, and fun. Thank you. Maybe whisky review of the year! Thanks, Matthew. Will try to keep things fresh here.